As usual - I had trouble sleeping last night. What better way to waste some time then to come downstairs and set up the camera to shoot some night time photos out the windows. I hooked up my new corded remote - bought it from a Hong Kong ebay store and placed the camera on a pillow aiming out the window. Too lazy to set the tripod up at 1am and the pillow seemed a good choice. The remote worked like a charm, it gets rid of the vibrations that occur when you press the shutter release. 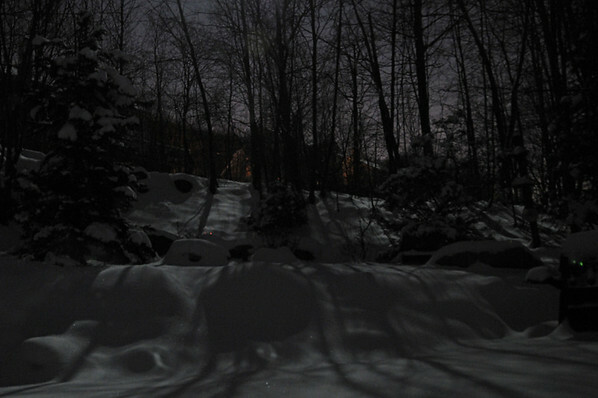 I took a bunch of photos using only moonlight and a neighbors automatic lights. All of my photos were 4 - 5 second exposures. It will be much easier in the summer when I get rid of the glare from the window I was shooting out of.